Therefore I was thrilled to be asked to take part in this blog tour for his latest novel Need You Dead. Need You Dead is the thirteenth book in the award winning Roy Grace series and as the tenth stop on the tour I get to take a quick look at the case file for his tenth book Want You Dead. 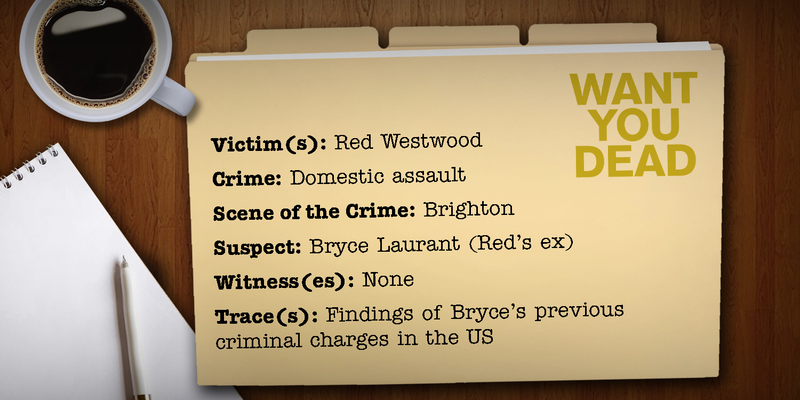 The victim in this case file is Red Westwood. Red was a single women who decided to try her hand at internet dating. Unfortunately things don’t go to plan and her and the man in question Bryce Laurent soon split up. Whilst at first he seems to have taken the breakup ok, soon things start to go downhill and our victim Red ends up in police protection. The main suspect is her ex Bryce, but without witnesses Grace needs his best team on the case. Moving forward to the new book, Roy Grace is still with his wife Cleo (who he married in Want You Dead) but there are problems on the horizon as Roy brings his ‘long lost’ ten year old son Bruno to live with them. The victim in Need You Dead is Lorna Belling. She has been having an affair in a bid to escape her violent marriage, so when she is found dead in her bathtub it looks as though it is an easy to solve case. Yet soon the evidence starts to point elsewhere. Need You Dead is another great novel from Peter James. It is a police procedural that is told in a simple straightforward timeline which makes a nice change from a lot of the previous backwards and forwards stories I’ve been reading. It was a really fast paced novel, with some very exciting chase scenes. I have to admit though there were some annoying bits where you know Roy is going to talk to someone, but we know he really shouldn’t. In fact this is probably the first book I’ve read in a long while that practically had me shouting at the pages, which shows just how engrossing it is. One of the things I really like about this series is the amount of research in each novel. The police procedural part of the stories are fascinating, but at no point do the descriptions overpower the story. The characters are always well drawn and right from the beginning you really care about them when bad things start to happen. There was quite a lot of back story involving Roy Grace and his family, so there are bits that if you haven’t read the previous novels you might find yourself skipping over. However the main storyline can still work as a stand alone novel, and it is definitely one that will keep you guessing until the end. I would thoroughly recommend reading all of the Roy Grace series and Need You Dead doesn’t disappoint. I do wonder how many variations of titles using the word ‘dead’ Peter James can keep coming up with though, I certainly hope he doesn’t run out of ideas soon! For the next stop of the tour head over to https://forwinternights.wordpress.com/ who will be looking at a Person of Interest tomorrow.